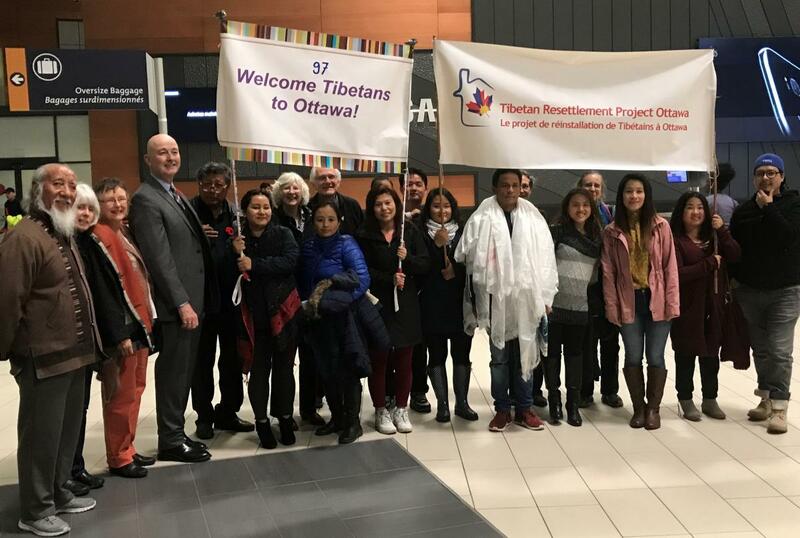 Our vision is a thriving Tibetan community in Ottawa, with at least 90 Tibetans from rural northeastern India sponsored for resettlement by 2016. 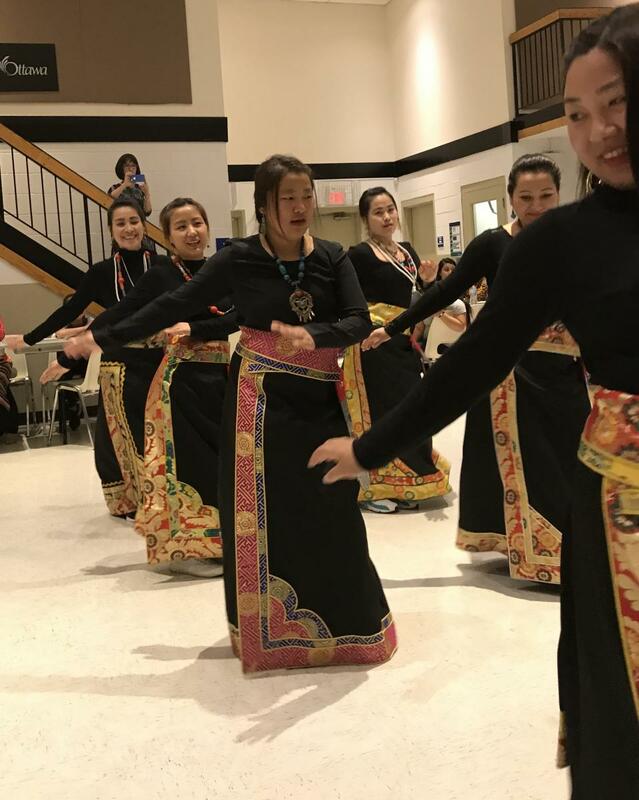 We have a volunteer board that directs our activities and maintains close contact with the national Project Tibet Society, our parent organization. 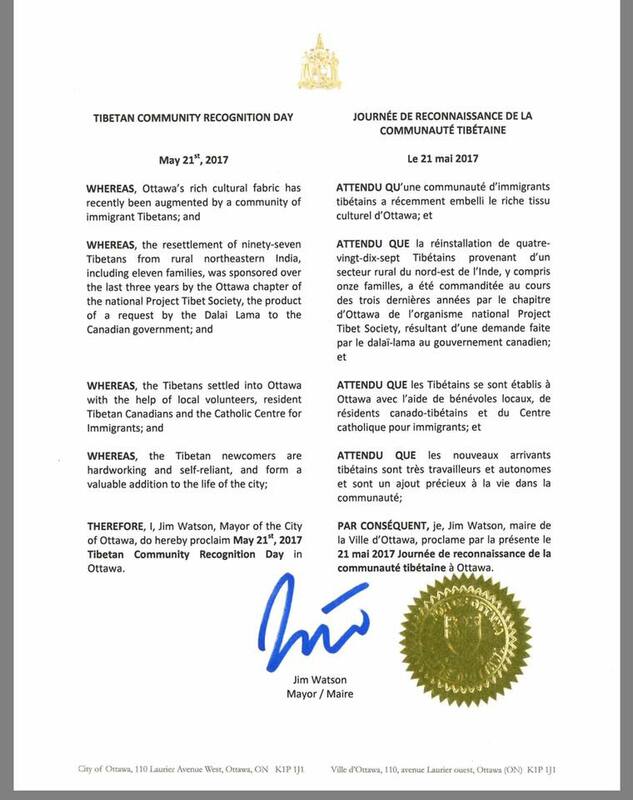 Our co-sponsor in this project is the Catholic Centre for Immigrants, a long-established provider of services to Ottawa’s new immigrants. The Centre’s Foundation uses CanadaHelps.org to collect online financial donations for the Ottawa project and issue tax receipts. 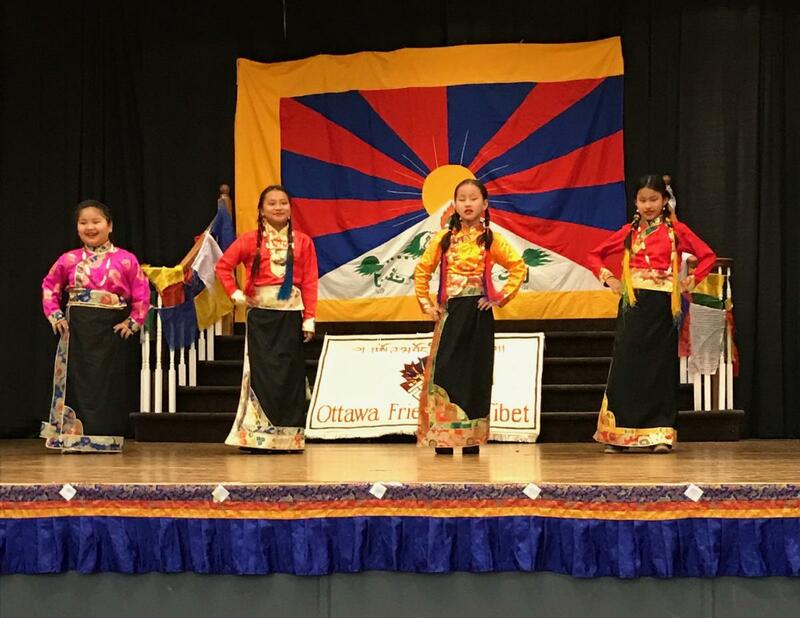 We collaborate with the newly created Ottawa Tibetan Community Association. Many heartfelt thanks to all who have helped us to reach and exceed our goal! We will leave this website up for one year, as a history of a highly successful resettlement project. November 2, 2017 - The Last Arrival! 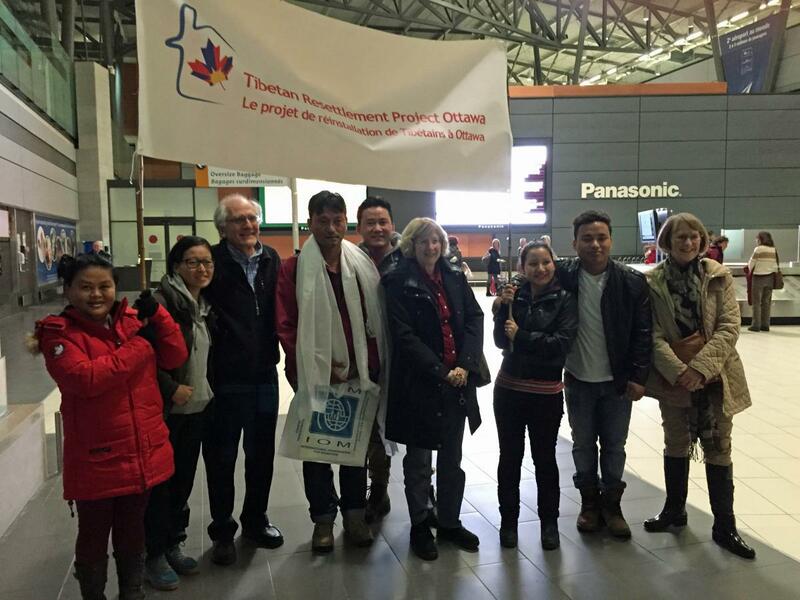 Our 97th and final Ottawa-sponsored arrival -- a single man -- landed on November 2 to an enthusiastic welcome. This was our 20th arrival ceremony. 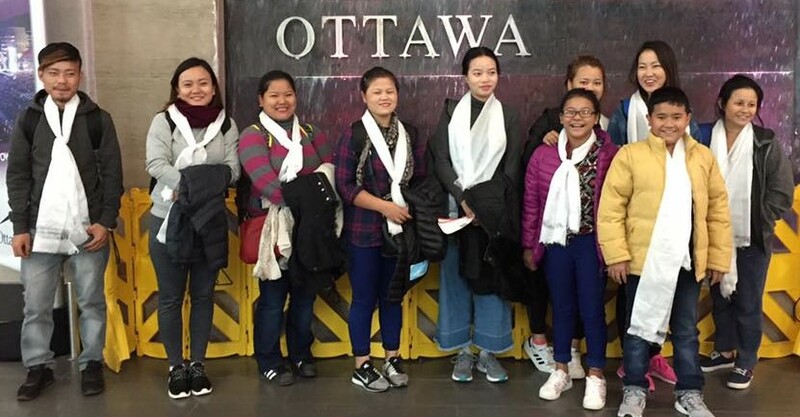 Six newcomers are currently in their first year in Canada and so their settlement is still the responsibility of our project. Thanks to all our many supporters! 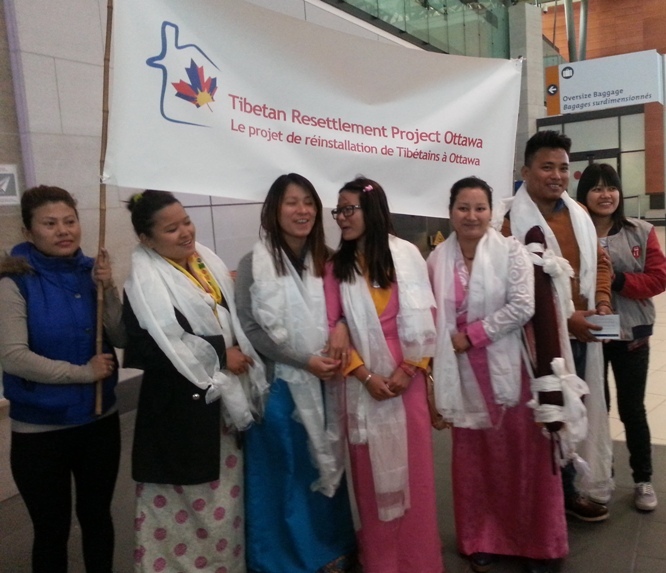 The two earliest Tibetan-Canadian residents of Ottawa meet the final arrival under our project. Left to right: Jurme Wangda, Kunsang Lhundup and Samphe Lhalungpa. Photos by Eliza von Baeyer. 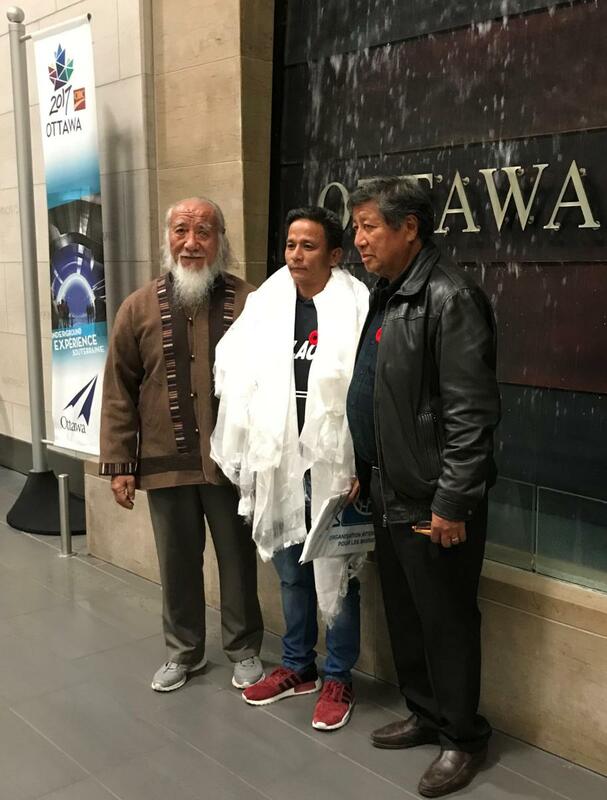 All our supporters were cordially invited to join us on Sunday, May 21, 2017 to celebrate the completion of our four-year project to sponsor 97 stateless Tibetans from northeastern India to Canada, most of them specifically to Ottawa. 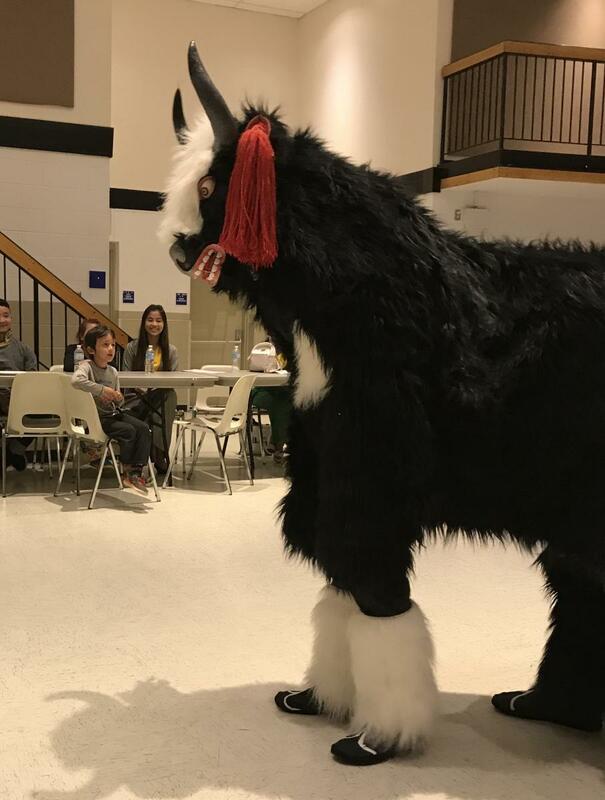 The festivities were held at Pat Clark Community Centre (Cyrville), 4355 Halmont Dr. from 5:00 pm to 9 pm. The evening was jointly sponsored by TRPO and the Tibetan newcomers. City Councillor Tim Tierney, representing Mayor Jim Watson, opened the event and proclaimed the day as Tibetan Community Recognition Day in Ottawa. 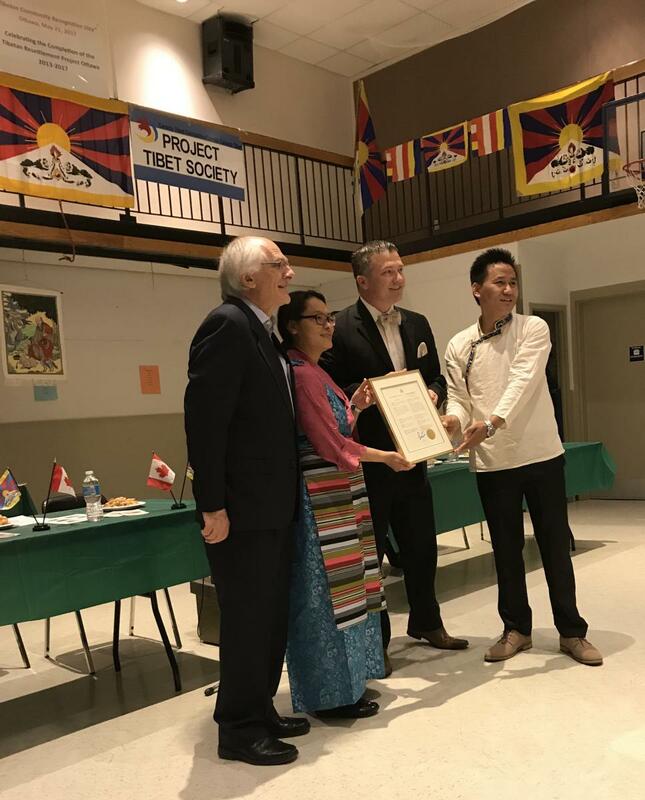 Here he is presenting the Mayor's proclamation to Gyaltsok for the newcomers from Arunachal Pradesh, Dawa Ghoso for the Tibetan community in Ottawa, and Cornelius von Baeyer for TRPO. 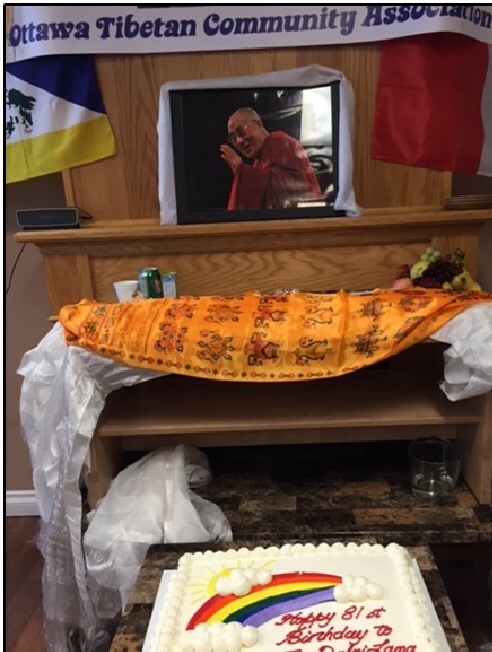 Also participating were Tashi Wangdi, retired Representative to the Americas of the Dalai Lama; Carl Nicholson, Executive Director of our co-sponsor, the Catholic Centre for Immigrants; and Nima Dorjee, head of our parent organization, Project Tibet Society (from Calgary). Lhakpa Dolma spoke on behalf of the newcomers. Our MCs were Josée Filion and Tsering Dolma. Traditional Tibetan dances were featured between speakers -- see the women's dance and the yak dance. A 'song of thanks' by the newcomers was then followed by a South Asian meal, with further singing and dancing. Participants received a Tibetan-Canadian crossed-flag pin. Thanks to Barb Haddad for photos. A sizeable crowd of well-wishers greeted the 4 new arrivals on January 19 - our 11th family and a single woman. This was our 18th airport welcoming ceremony. Two more individuals are still to come, but we don't have a time-frame yet. They will bring our revised grand total to 97. See our December 2016 Newsletter for the latest information on our activities. Ten people, including a mom with two children landed on November 9 to a very warm welcome. 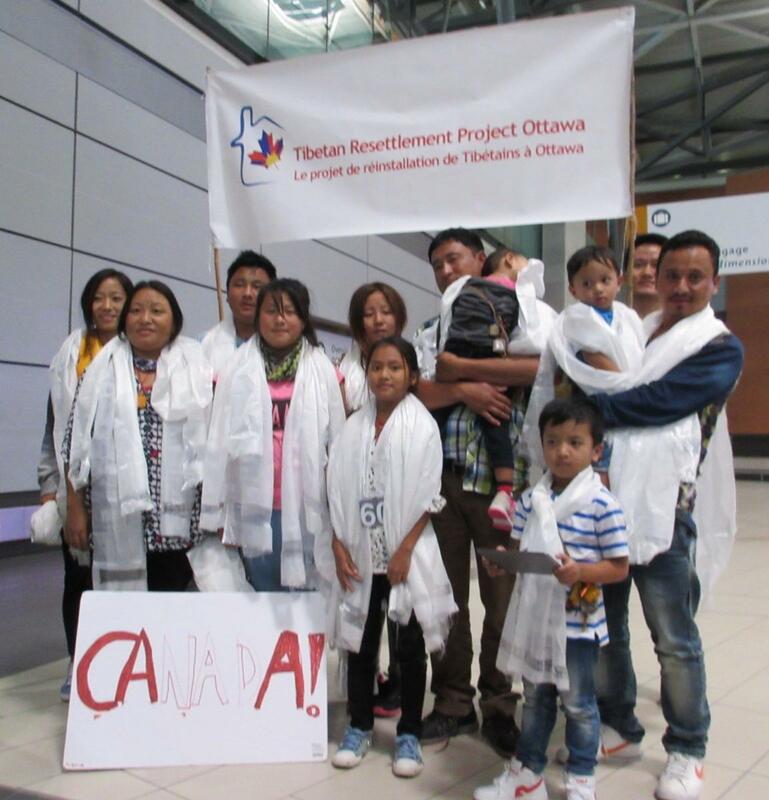 The number of Ottawa-sponsored arrivals is now 91. The three arrived on a Wednesday morning, to a small but very enthusiastic welcome. 5 single adults and a family of 3 arrived late and without luggage, but we provided a warm welcome! A day late, but better late than never! We are up to 70 Ottawa-sponsored arrivals now! Chenga Lhamo and Pema Yeshi arrive to a small but warm welcome! The flight was only 2 days late! A highlight for us: OFT donates to TRPO for its resettlement project the award money that OFT had received from Friends for Peace Day for its humanitarian work. 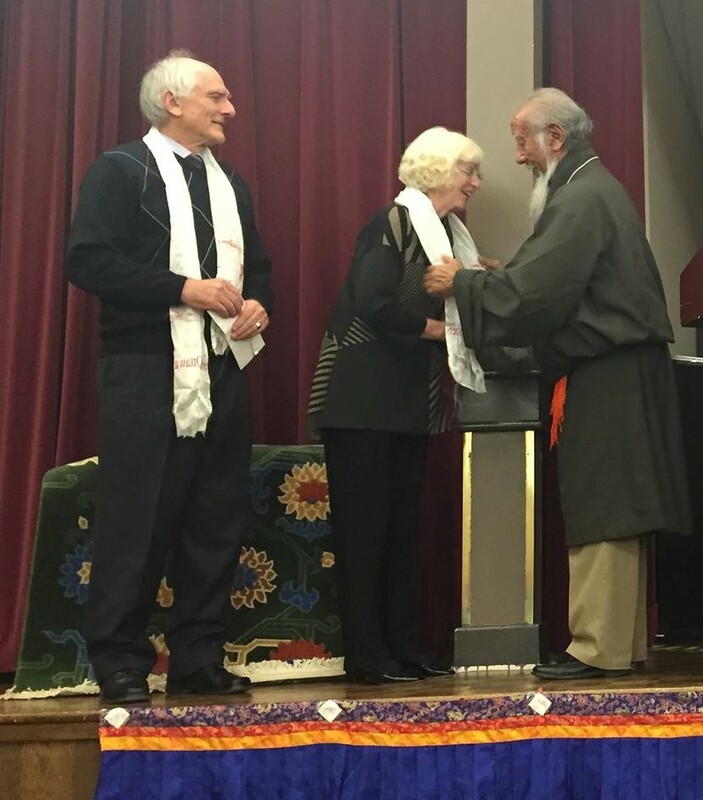 Here Cornelius and Edwinna von Baeyer gratefully accept the donation from Jurme Wangda. See also the poster for the dinner. September 10, 2015 Arrivals - 11 more! We saw the reunion of a family (dad and two sons join mom and daughter who came in July), as well as the arrival of a new family of six, and two single women. 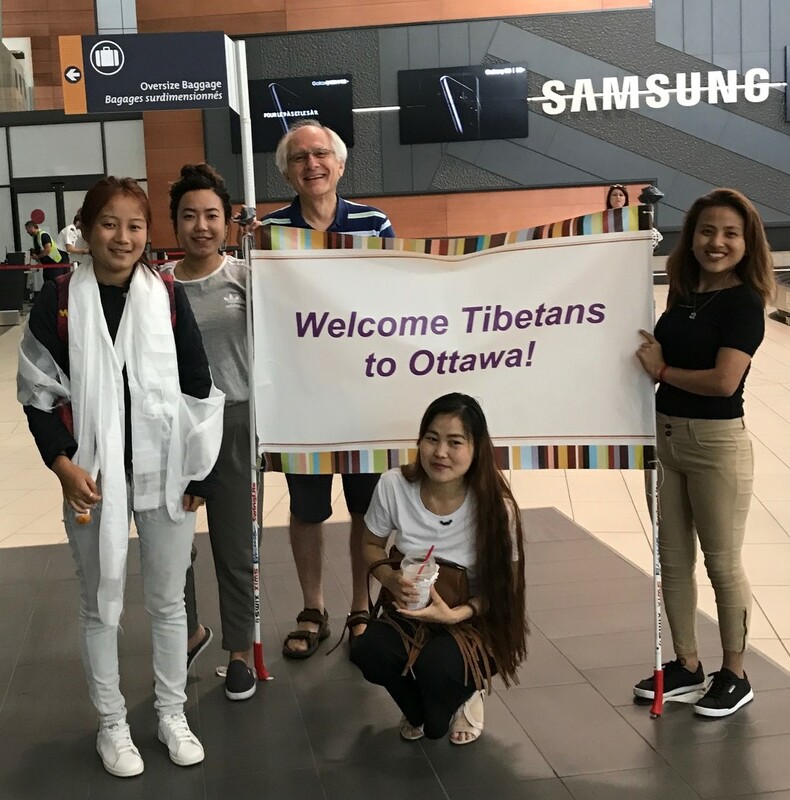 A special moment for our chair who welcomed the 60th Ottawa sponsored arrival! July 16, 2015 Arrivals - We welcomed 13 people! The group included our youngest to date (8 months old), as well as a 2-and-a-half year old. The total of arrivals is now over half of the 90 we are to receive. See the story in the Ottawa Citizen by Anaïs Voski, with two photos. 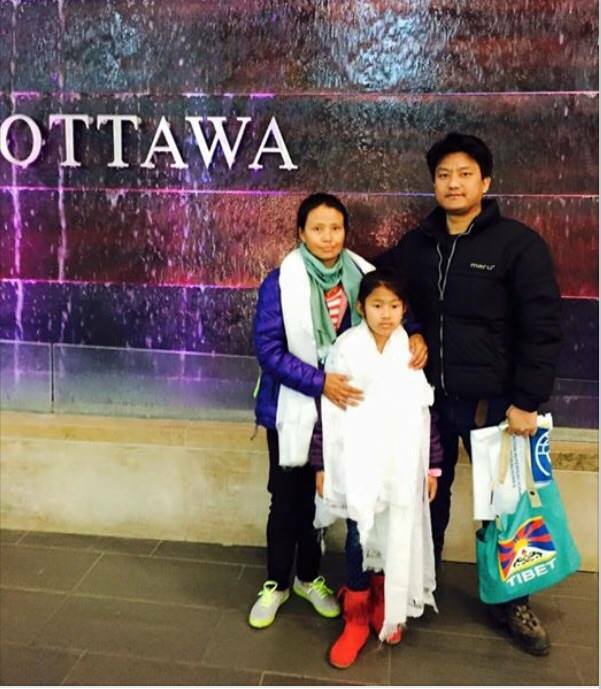 Dawa Tsering is reunited with his wife Chechu Dolma and their daughter Tenzin Yangkey. Our tenth airport arrival ceremony! Alan Neal, who first interviewed Jurme in 1997, talks to him again about his connections to the world of films, as well as to the growing Tibetan community in Ottawa. 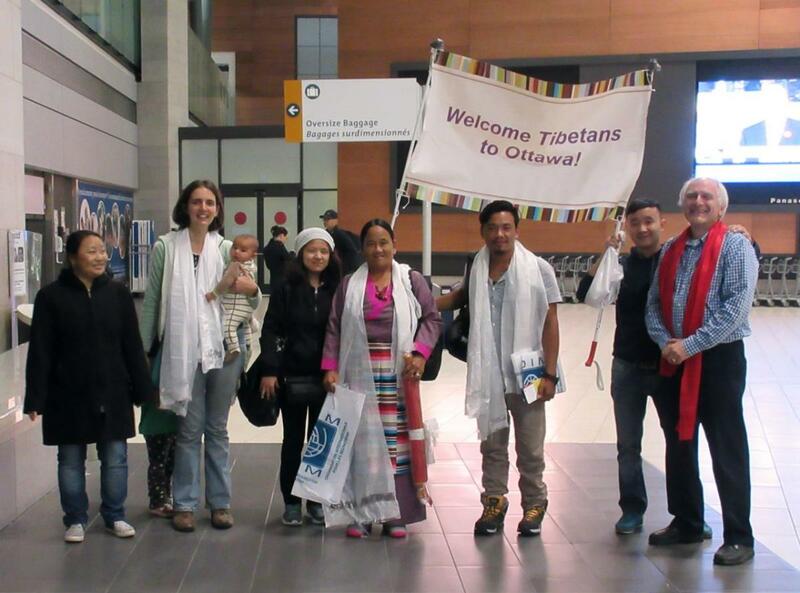 Dawa Tsering arrived in Ottawa to a warm welcome. His wife and daughter follow on April 1. 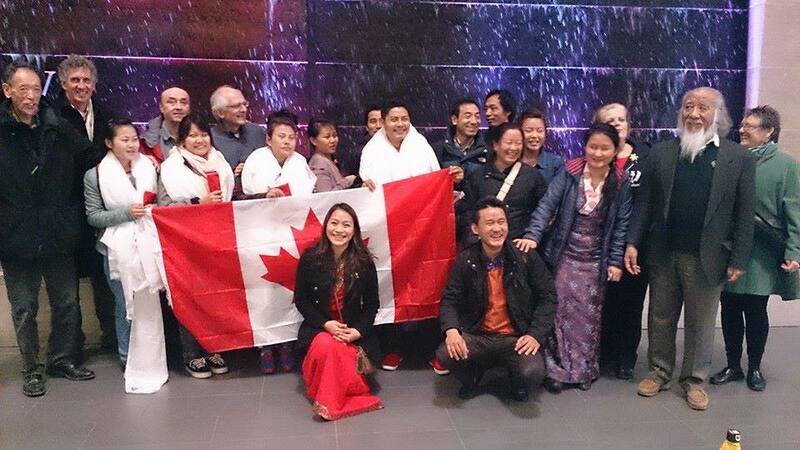 On November 19 Chhimey Dorjee arrived to a rousing welcome (after a lengthy delay in Toronto). On November 29, we celebrate the one-year anniversary of the first group to come to Ottawa! 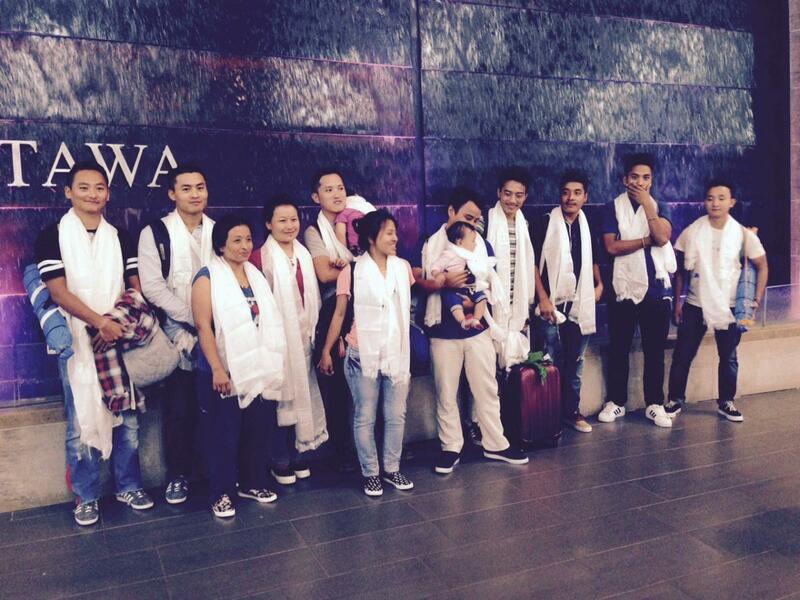 We have come 1/3 of the way in reaching our goal of bringing 90 stateless Tibetans from India to Ottawa. See the CBC news coverage. 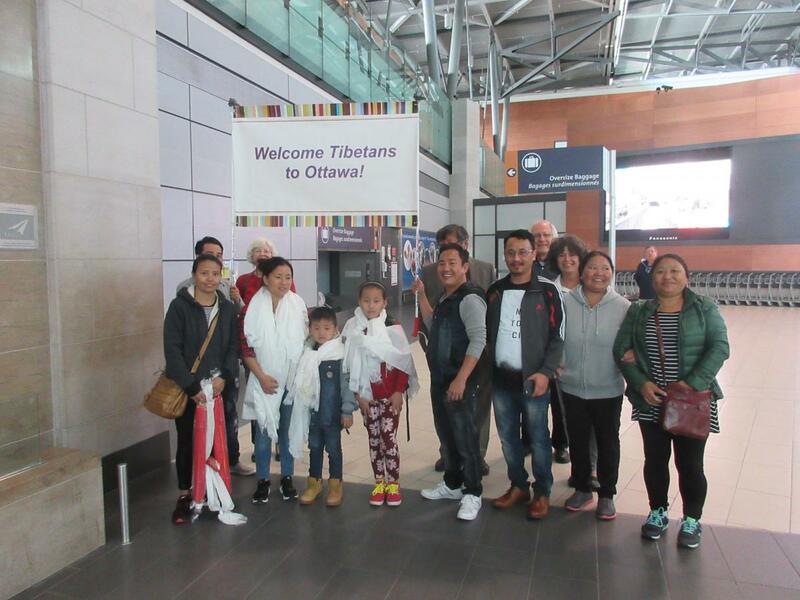 Several of the new arrivals have relatives and friends among those who came in November and April -- the Ottawa Tibetan family is growing! 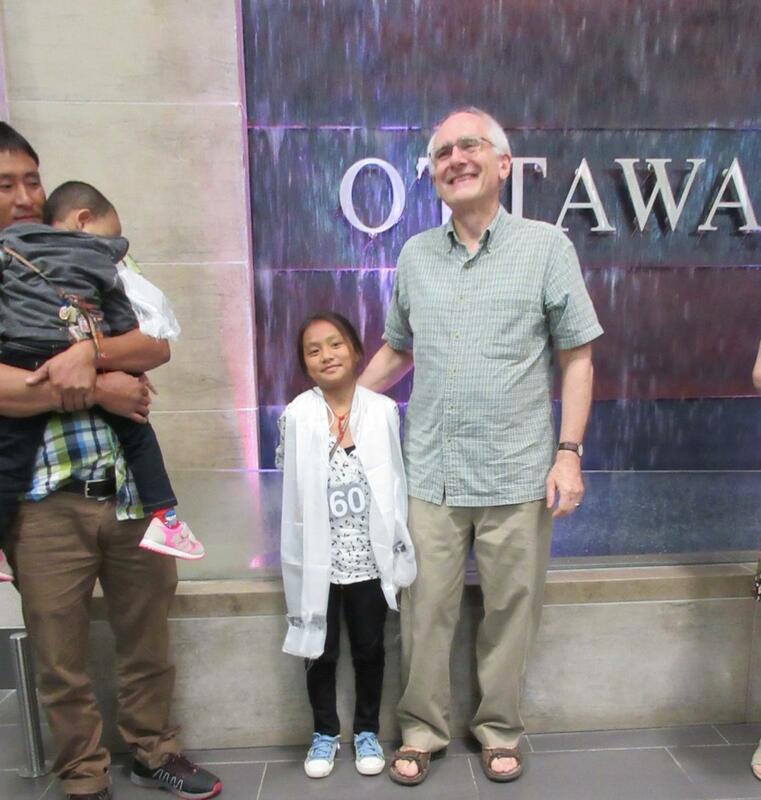 On April 5, our first family came to Ottawa -- the mother and three teenagers will join the father, Chime Palden, who came last November. We welcome Kalsang Dickey, Tenzin Kunsel (17), Tenzin Tsering (16), and Tenzin Kunchok (12). 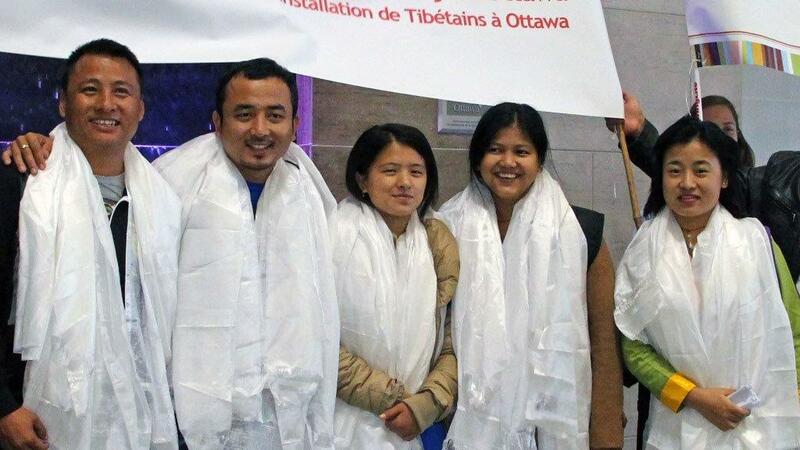 Then on April 16, four single Tibetans landed: Kunsang Wangchuk, Kuku Lhamo, Tenzin Phentok, and Pema Choedon. A sizable crowd welcomed them to Ottawa. 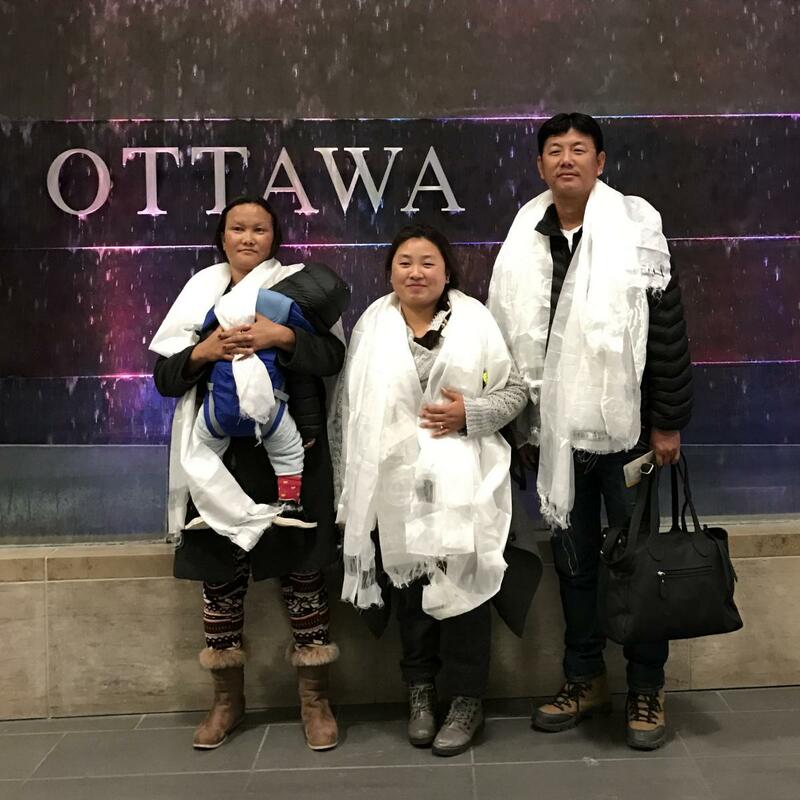 Finally, on April 23, five more single Tibetans came to Ottawa: Dorjee Chonzom, Tsering Dolker, Tenzin Palkey, Tsering Wangmo and Lhakpa Tsering (Jr.). 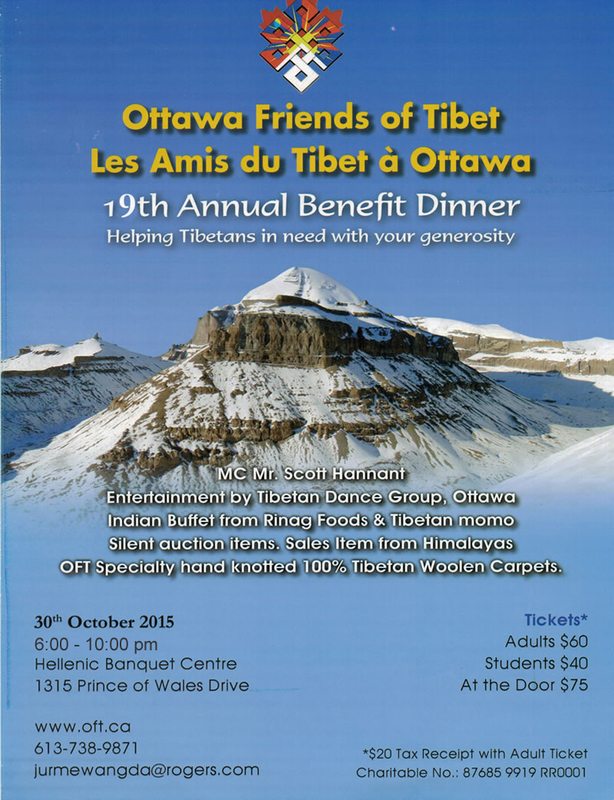 By the end of April 2014, the Tibetan population of Ottawa had effectively doubled! See the arrival at the airport on CBC News Ottawa for Nov. 29. See the Ottawa Citizen story of December 2. House of Commons: MP Peggy Nash (NDP) welcomes Kaydor Aukatsang and the new arrivals. Hear Cornelius von Baeyer and Dawa Ghoso describe the planned arrival on Radio One's All in a Day with Alan Neal (Nov. 29, 2013). Hear Cornelius and Samphe Lhalungpa describe our Film Night on All in a Day (Oct. 15, 2013). 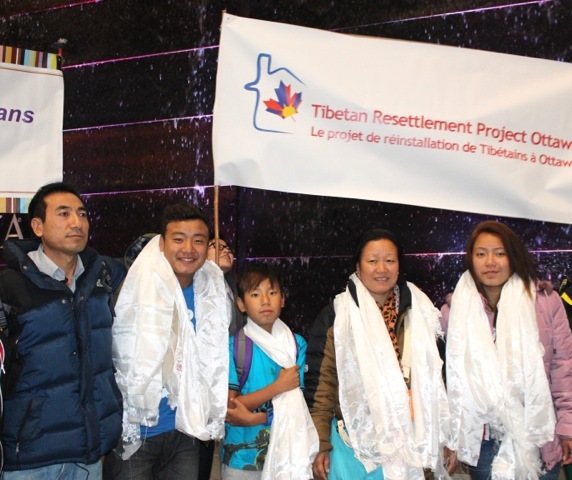 Project Tibet Society, our parent organization, manages the overall program to settle 1,000 Tibetans in Canada. 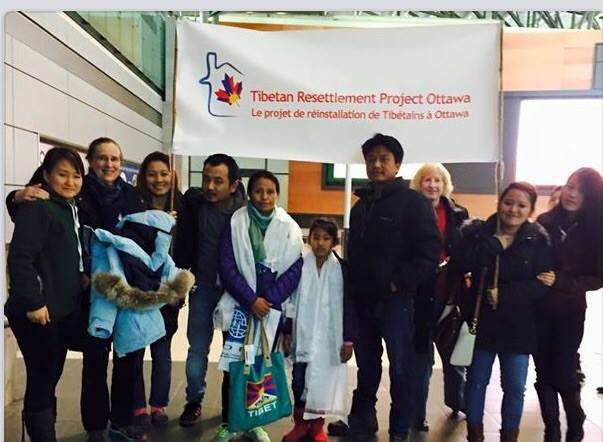 Project Tibet Society works with Citizenship and Immigration Canada and the Central Tibetan Administration to ensure the success of this Canadian humanitarian project. 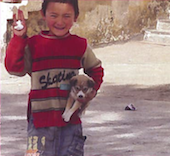 Further information on the national project is available from Project Tibet Society.